Belongs to my sister katethebass, read during the Christmas holidays and then passed back to her! Really enjoyed this travel tale of a round the world journey on motorbikes. 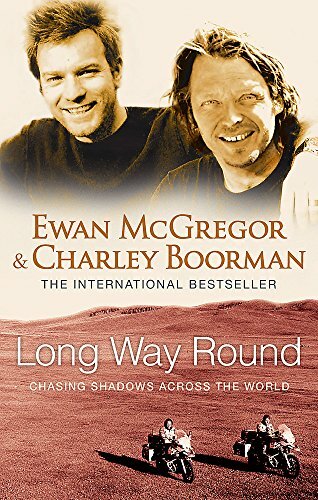 The book really explored the tensions and friendship between Ewan and Charley, and between them and their support team. An honest tale of travel! Long Way Round is the tale of a remarkable journey taken (on motorbike) by two men. The fact that those men are figures with notable film connections (Ewan McGregor is one of Britain’s most successful actors, Charley Boorman is the son of the celebrated director John Boorman) may be the reason the book got written – and the accompanying television series got made – but so what? This epic trip is conveyed with real élan by its two authors, and there are arguments for preferring the written word over the image: while the latter may convey the exhilaration of the journey more directly, the book is infinitely more subtle in presenting the mindset of its two (often-beleaguered) travellers. Their co-writer Robert Uhlig has cannily conveyed the similar (but at the same time, very different) personalities of the two men, and it’s one of the pleasures of the book. McGregor, for whom motorbikes are as important as his acting career, was gazing at a map of the world when it occurred to him that it was possible to ride by bike all the way round the world (with just a smidgen of cheating around the Bering Strait), and he suggested over a meal with best friend and fellow thesp Charley Boorman, that the pair might chase their shadows from London to New York, across the Pacific to Alaska and other far-flung parts. Needless to say, catastrophe matches the adventure at every turn, and encounters with gun-toting Ukrainians, Mongolian Nomads and (most dangerous of all) ruthless paparazzi add to the stress levels. But the 20,000 miles covered by the pair, however arduous for them, makes for a highly diverting experience for the reader. Now how do they follow this? Motorbikes are not built for lunar excursions… --Barry Forshaw --This text refers to the Hardcover edition.